Apologies in advance for the crap pictures I took them quickly I'll do a proper photoshoot One day soon I promise!!!! Your looking at my lovely Alpina B3 Bi-Turbo saloon 1/10 UK saloons. Production number 104. A differential flush and refill. 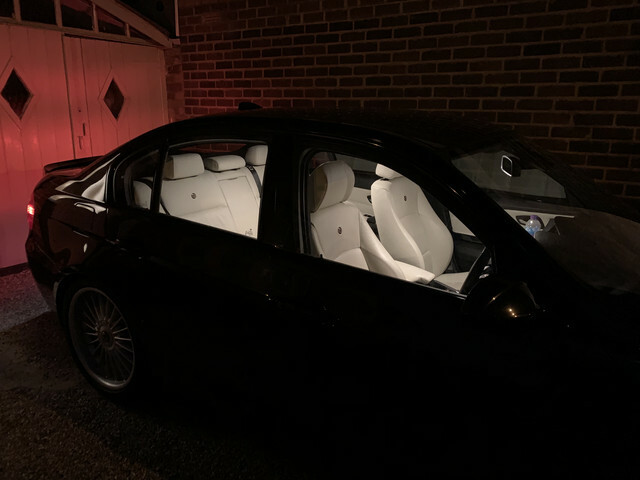 A 50% tint to the back windows looks to plain as it is I've always had factory privacy glass on my other cars so this feels very weird as it is. Gold Alpina Stripes down the sides like it would have from factory. (Any recommendations of where to buy would be amazing). Steering wheel retrimmed at some point anyone else had this done? Should this one have Sytner plates? As it's on Borehamwood (KL) not Nottingham (Fx) plates, was it supplied by Sytners or direct from another dealer, Specialist Cars/Wollaston maybe? I would be wanting to add Dekor stripes too, but as Hap says I'd be inclined to keep it original elsewhere, leave the windows and grills as they are. Steering wheel retrims are tricky as I don't think anyone has found someone who can replicate the original loop rather than criss-cross stitch pattern. Last edited by CaesarBob on Tue Apr 16, 2019 11:09 pm, edited 1 time in total. But although Sytners will source and probably add stickers to the vehicle, if they are unique orders aren't they delivered by other dealers, so could legitimately carry other plates? Looks like the car was registered on a private plate from new. That’s why it’s not got a fx number plate. Amazing car so rare. Looks very nice! Very special to those that know! 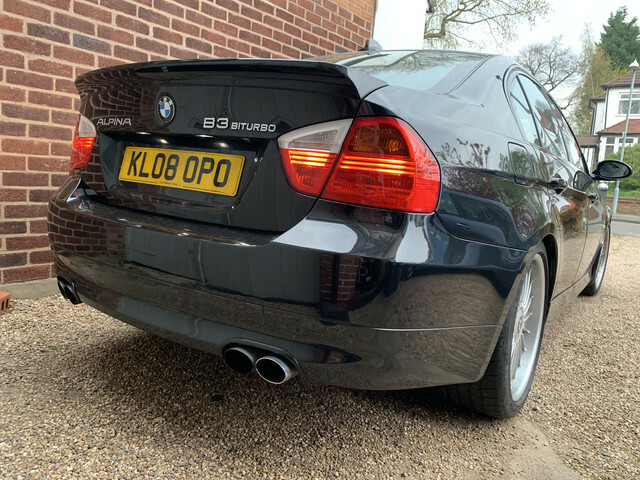 I agree with the stripes, can't say I'm a fan of back grills, just taken mine off my E91 and it looks all the better for it, but then mines Montego blue with silver stripes so it made sense. I still stand by the idea that Alpina got it right first time. That being said, if you're putting things on that you could add at the time then why not! Your changes sound tasteful and it would still make my day seeing your car on the road! Good shout from CaesarBob on the wheel stitching, I was thinking of retrimming but I would never have thought of that! It would have annoyed the hell out of me the minute someone mentioned it! Love the upholstery, esp the Alpina roundels. 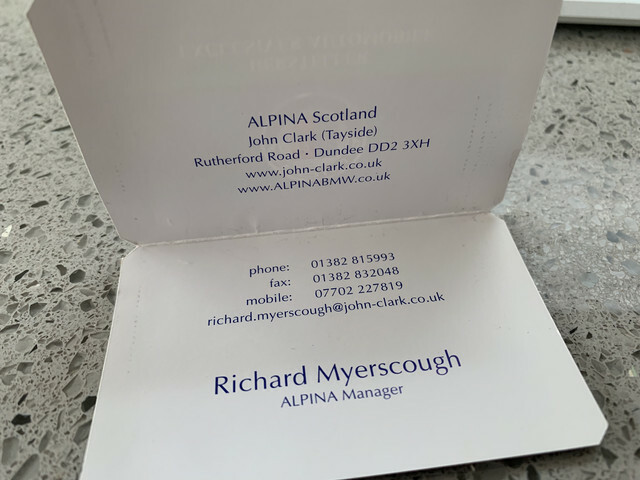 To answer your questions The car originated new from Alpina Scotland - John Clark (Tayside) in Dundee.Perhaps Sytner supplied it to them? Yeah i might not put black grills, i was thinking it might i give it a more stealthy look but i might leave it standard undecided either way i'd always keep the original grills to reverse it back at a later date! I guess my take on the matter is that Alpina got it right 10 years ago a little change here and there to smarten her up wouldn't necessarily be a bad thing. But might just leave it standard as as with most of my cars i never really change or modify anything from standard. The windows i might darken a little at the back especially as sometimes i carry my kids in the back and don't like them being blinded by sunlight so this isn't pure aesthetic but practical also!! (Yes i know letting kids in my Alpina what am i thinking haha ). Never thought about the stitching before ... Even if i could get that replicated my biggest concern is around the built in gear change shifter buttons!!! Not sure what else i can really do to freshen the wheel up its a bit shiney. Interesting that this was originally a John Clark car, so it should be an SP-ST reg technically then. I had them fitted to my F30 B3 Black with Gold stripes and it looked awesome. I got them from Sytner and had them professional fitted. Your car would look awesome with them. Great car by the way. 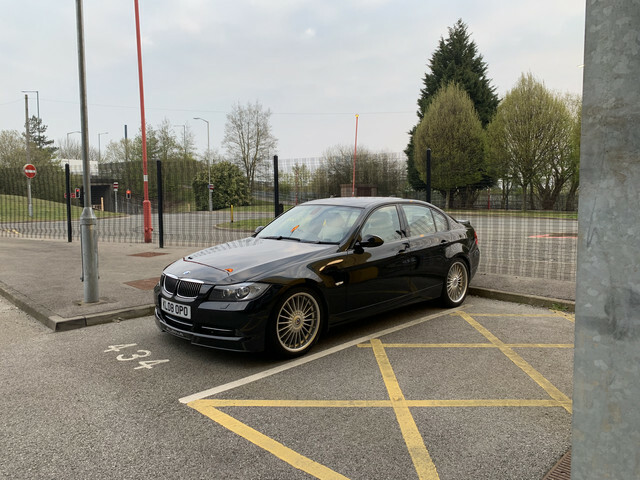 I had an E90 B3 Bi-Turbo Saloon in Moonstone metallic and it was a lovely thing. Wow looking good. As mentioned on the other post was eyeing up this one as its quite rare or as some dealers would describe EXTrEmely Rare!! Would have got decal stripes on mine but personally dont like the way the front wing stripes finish into the lights on an e46. Think they would be fine on yours. A beauty! You have a lovely car there, enjoy! Both my Alpinas have factory tints and I HATE it! Personally i think it ruins the look of the car as only the back windows are done, so side on you get that weird half done half not done look. My B10 is black and the black tints make it look like a gangster's car! It's just about passable on the D5 as it's Alpina blue. I realise I will be in the minority having this view and most cars these days have rear tint/sun protection glass. If I'm not mistaken Burkard Bovensiepen forbids any of the Buchloe demo cars to have sun protection glass. Personally I'd prefer sun blinds to do the shading job. Steering wheel - as pointed out the stitching is very difficult to replicate. If the only issue is shiny leather, then use a good leather cleaner carefully (don't rub too hard) and it will make a massive difference. If this is not enough then you could go down the restoration route, but it will be fiddly and time consuming (as you'll need to protect the stitching).